NOTE: THIS PUBLICATION IS AVAILABLE IN SOFTCOPY ONLY. 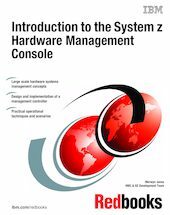 In this textbook, we provide students with the background knowledge and skills that are necessary to begin using the basic functions and features of the System z Hardware Management Console (HMC) and System z Support Elements (SE). This book is part of a series of textbooks that are designed to introduce students to mainframe concepts and to help prepare them for a career in large systems computing. For optimal learning, we assume that the students are literate in personal computing and have some computer science or information systems background. Others who can benefit from this textbook include z/VM® and z/OS® professionals who want to expand their knowledge of other aspects of the mainframe computing environment. System z Hardware concept and the history of the mainframe. The HMC and SE user interface and user management. System z First Failure Data Capture and Serviceability functions. Monitoring the System z performance using the SAD. Implementing the networking capabilities of the HMC. Partition resource movement and sharing. System z Customer Upgrade on Demand advanced functionality.